Starting October 21st, the Tiffany Series Concerts will kick-off with Sean Jones and Friends. Sean is an internationally acclaimed jazz trumpeter as well as the new Peabody Jazz department chairman. This concert will be held October 21st at 3 pm. Next in the series, The BSO Brass will conduct A Brass and Organ Concert Sunday December 9th at 7 pm. In addition to the BSO Brass, Brown’s own Michael Britt, organist will perform. They will be performing traditional brass pieces and holiday favorites. Third in the series will be an organ concert by Christopher Creaghan. Christopher is from New York City’s Riverside Church. This concert will be held Sunday March 17th, 2019 at 3 pm. 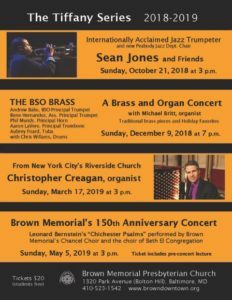 The final concert will be Brown Memorial’s 150th Anniversary Concert. The Brown Memorial Chancel Choir will perform as well as the Beth El Congregation. The concert will be held Sunday May 5th, 2019 at 3 pm.